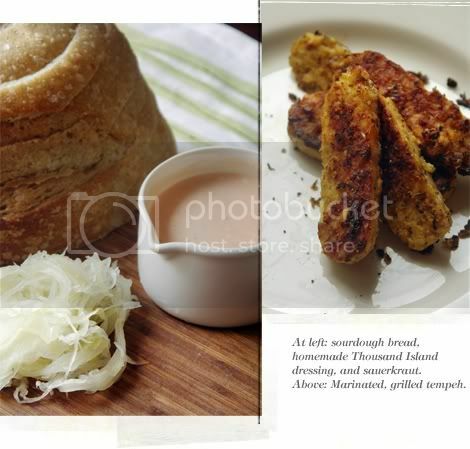 The recipe for this completely drop-dead delicious Tempeh Reuben was suggested by my good friend Amy. We got together and she really took the reins on this one — I just stood by, waiting to eat! Amy's secret? A delicious tempeh marinade, and adding Sriracha to the dressing. 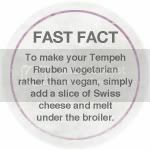 If you don't prefer that extra kick you can skip the rooster sauce, but I can't imagine Amy's perfect Tempeh Reuben without it. Marinate the tempeh: Combine the marinade ingredients in tupperware or a large zip-locking freezer bag. Add the tempeh to the marinade and seal, allowing to sit in the refrigerator for 45 minutes to overnight. In the meantime, prepare the dressing: Combine the Vegenaise, ketchup, pickle relish and Sriracha in a small bowl. Cover and set aside in the refrigerator until the tempeh is finished marinating and has been cooked. Make the Reuben: Heat the sauerkraut over medium heat in a small saucepan, stirring occasionally. Lightly coat a medium pan with olive oil; heat the olive oil over medium heat and add the garlic and onions. Cook until softened and add in the tempeh. Fry the tempeh for about 4 minutes on each side. Meanwhile, toast the rye bread on each side (this can be done in a toaster, or on a grill pan to get beautiful grill marks). Once the bread has been toasted to your liking, add a slather of Thousand Island Dressing on both pieces of bread for each sandwich. 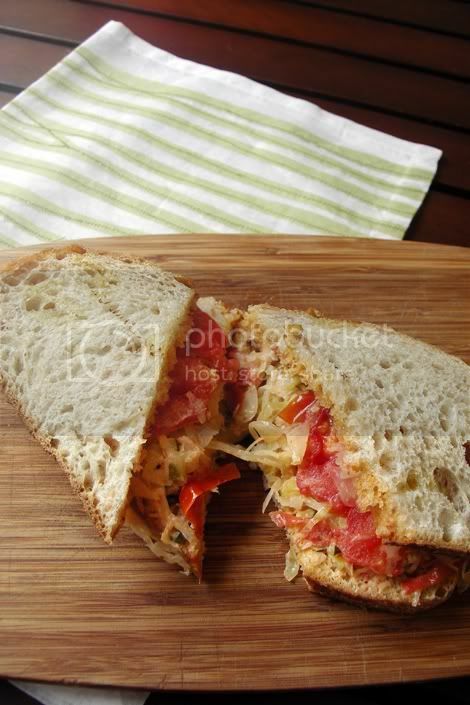 Top with the cooked tempeh, onions and sauerkraut, and tomato if using. If adding Swiss, melt under the broiler and serve immediately. This looks awesome! I like the addition of onions - I don't like a lot of sauerkraut on my tempeh ruben and the addition of sweet Vidalia onion seems like just the right thing to help temper the sauerkraut for me. It was so awesome, I can't even begin to describe it's awesomeness with words. My friend Amy marinated and fried the tempeh perfectly, too. And for me, the addition of Sriracha to the dressing put it over the top.